C-track and slides are the smallest and lightest of Ronstan’s track and car systems. The lightweight aluminium track is only 19mm (3/4”) wide and the “C” profile encapsulates the slide cars for the lowest possible profile. 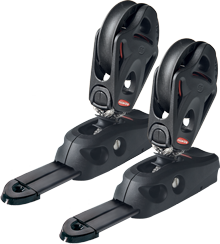 Slide cars are made of lightweight, but strong glass fibre-reinforced nylon and are available in various configurations with attachment points, position setting plunger stops and rope cleats. They suit light loads, pulling directly out from the line of the car and track, and repositioning when un-loaded. 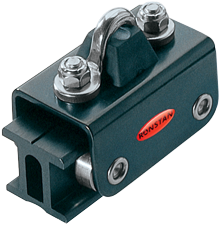 T-track continues the capacity of Ronstan’s sliding track and car systems. As with the C-Track system they suit loads pulling directly out from the line of the car and track, and repositioning when un-loaded. T-track is available in two series/sizes, 25mm (1”) and 32mm (1 ¼”) with moderate load capabilities. Slide cars in the 25mm (1”) series are made from glass-fibre reinforced nylon for light weight, strength and low friction on the anodised aluminium track. They fit over the track and can be easily removed with no loose parts to be lost. Series 32mm (1 ¼”) slide cars are made from either machined aluminium or grade 316 stainless steel for ultimate durability and strength. They have low friction acetal slide inserts to facilitate easy positioning. Cars are available with a variety of options including attachment points, pulley blocks and spring loaded positioning pins/stops. I-Track and wheeled car systems are an effective and robust track and car system. They allow position adjustment or free movement under load for loads pulling directly out from the line of the car and track. Strong stainless steel bodies with flared sides and angled wheels provide high load capacity with a small tolerance for off centre pull. Stainless steel ball bearings further enhance the smooth operation and excellent corrosion resistance of these cars. I-Track is available to special order, curved in either the horizontal or vertical plane. Cars are available with a variety of attachment points. Separate spring loaded positioning pins/stops are available, or models with integrated positioning line attachment points or pulleys are available. 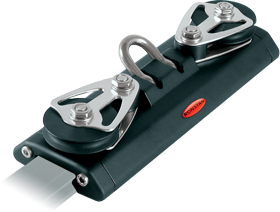 Matching track end stops with pulleys, and rope cleats allow remote position control. 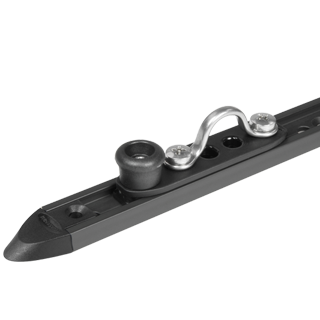 Ball Bearing track and car systems are available in 7 sizes from a tiny 14mm (9/16”) track width up to a 55mm (2 3/16”), and with load ratings to 19,000kg (41,800 lb) – pulling directly out from the line of the car and track. Low profile machined alloy car bodies provide high strength and durability with minimum weight. The highly efficient recirculating acetal or Torlon® ball bearing system allows precision adjustment and control even angular load conditions. Spring-loaded plunger stops engage with stop holes in tracks and can be locked in the “up” (disengaged) position if required. A variety of attachment points, pulley blocks and position control line accessories support the extensive program. Beam track options are available for unsupported spans and curved track can be supplied to order curved in either the horizontal or vertical plane. The minimum bend radius depends on the car length.